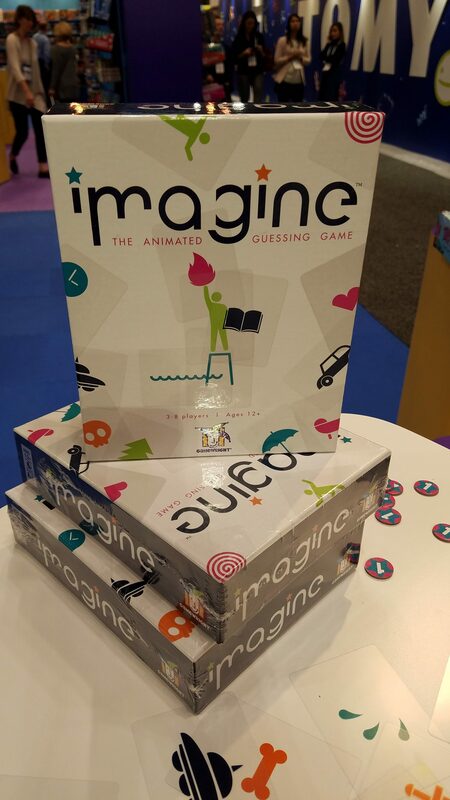 One of of the larger booths I visited at Toy Fair was Gamewright. 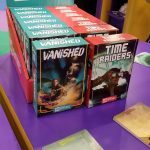 Several small games were on display as were some games that are about to return to your game store’s shelves. 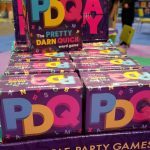 In the Port-A-Party line of small games, they had Think ‘n Sync and PDQ, both available in March for $10. 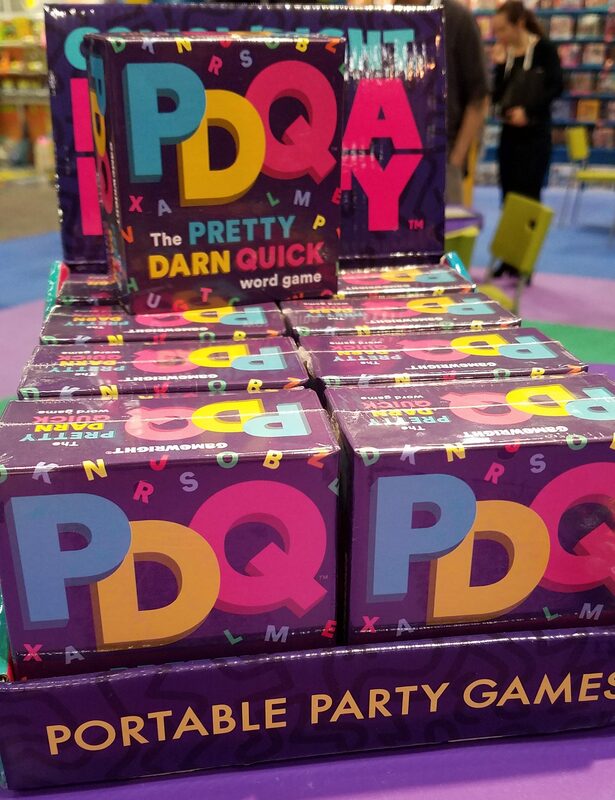 PDQ, which we’ve discussed before, has been out of print for five years and returns in a box sized to fit in the Port-A-Party line. 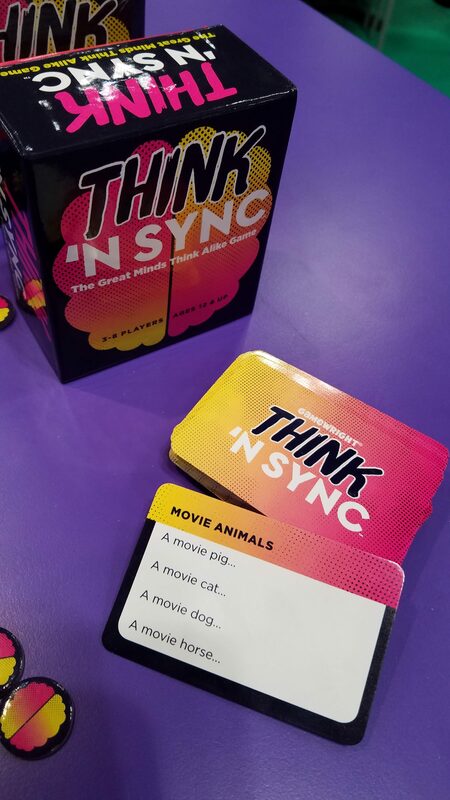 In that game, three letter cards are placed in a row and players race to create a word using those letters either left-to-right or right-to-left. 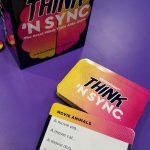 Think ‘n Sync is a game that reminded me a bit of Family Feud, except everyone shouts out their answer. 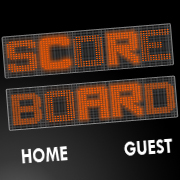 Matches gain points. 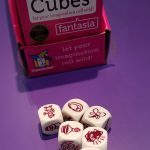 Rory’s Story Cubes, Fantasia edition, is on its way for a summer release ($8). 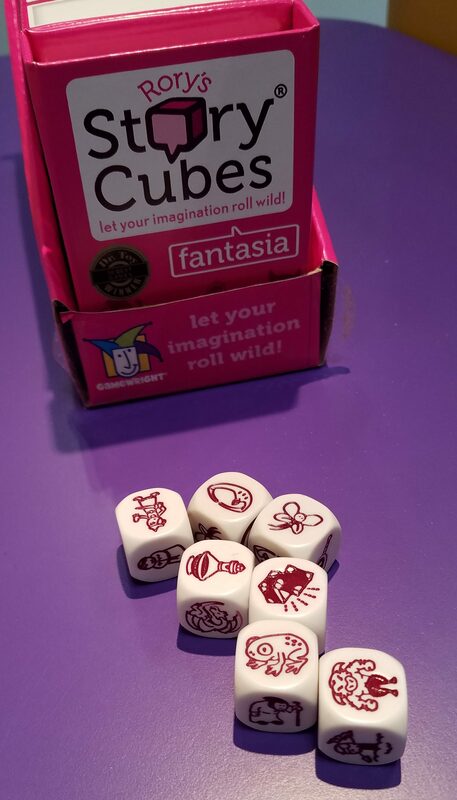 Fantasia contains three Enchanted dice, three Myth dice, and three Medieval dice. 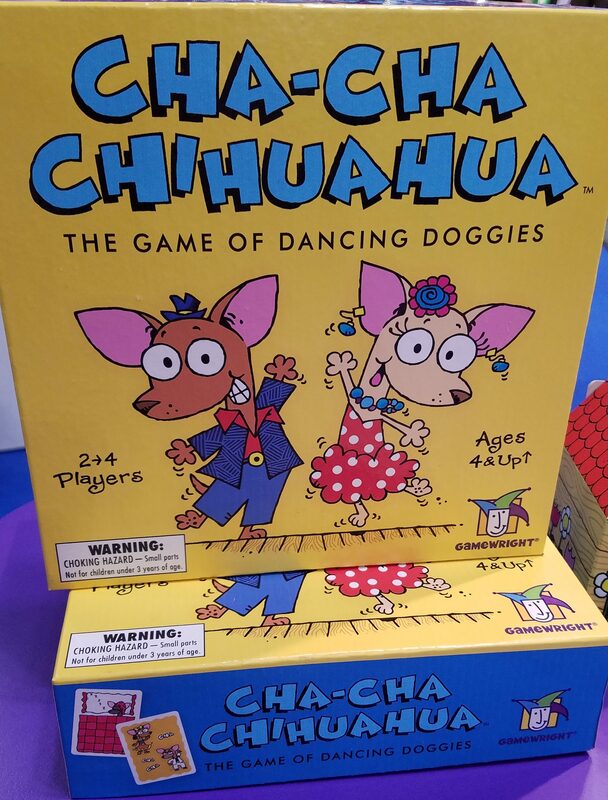 Cha-Cha Chiahuahua (summer, $16) comes with a bunch of little doggie figures and several disco dance floors for kids 4 and up. 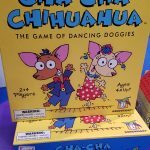 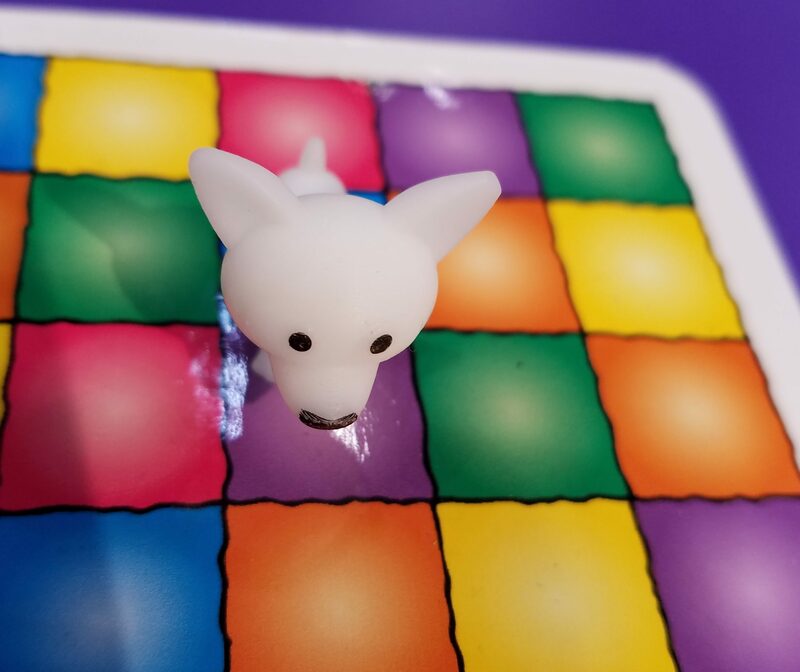 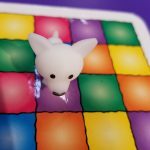 Do activities and place your dancing pups on the color-coded dance floor. 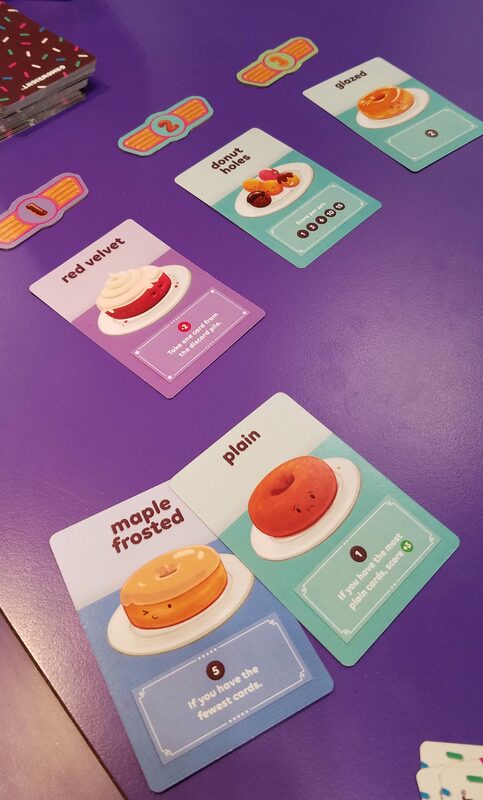 Go Nuts for Donuts (summer, $15) is a Sushi Go-like game with bidding instead of drafting. 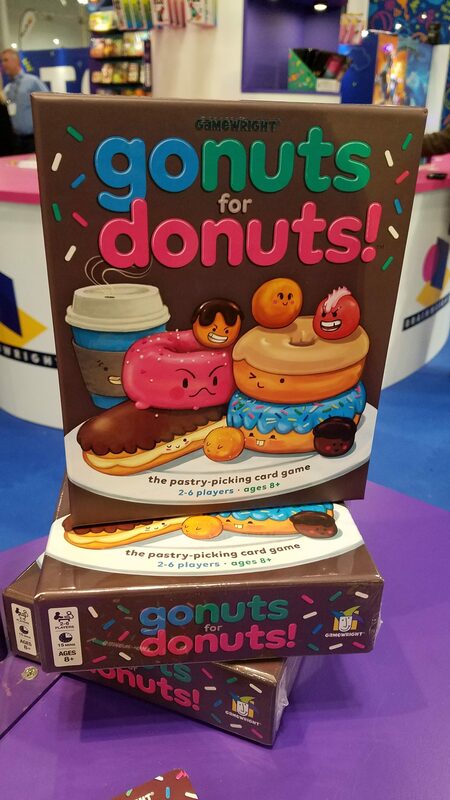 Donut cards are laid out and you select which one to add to your collection; if others are also going for your choice, you all lose out. 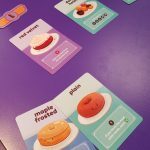 Each type of donut has different abilities, such as a point reward for having the fewest cards, ability to steal donuts from the discard pile, or a significant number of points for having a large collection of one type. 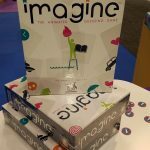 Imagine (now, $15) is charades with clear cards. 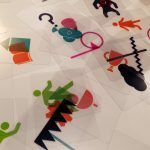 Transparent cards with symbols printed on them are layered atop one another to create images others have to guess. 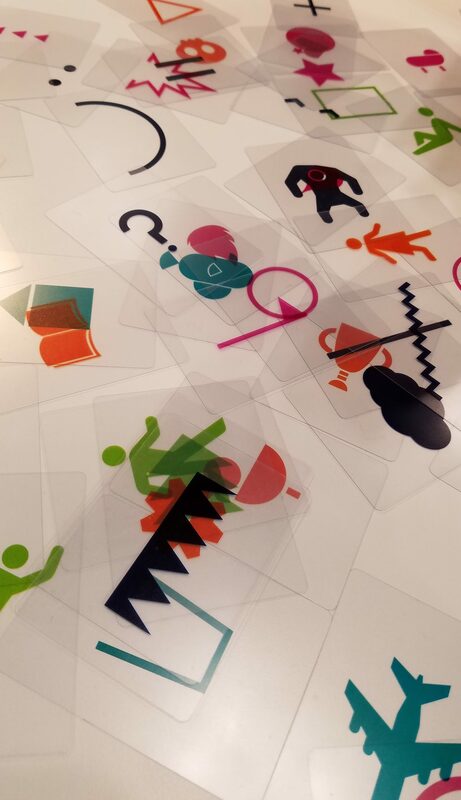 A clever way to use see-through cards. 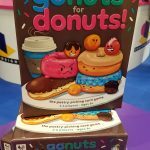 Can you tell what’s on the center of the box above? 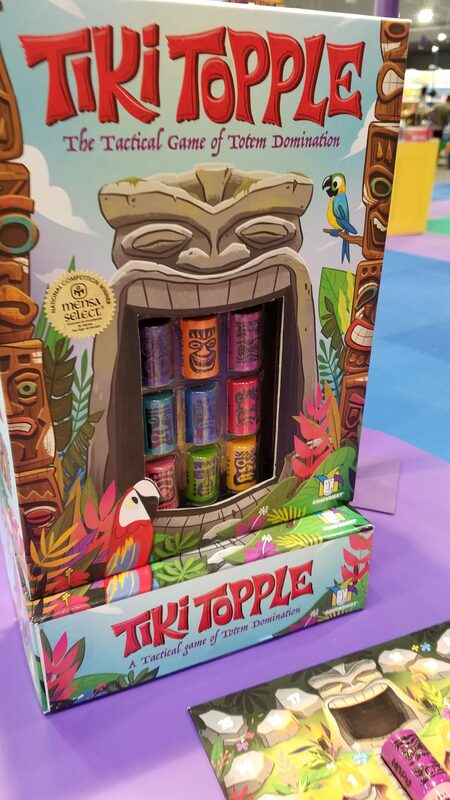 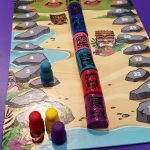 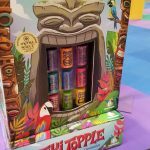 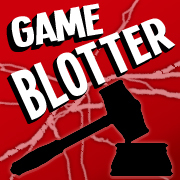 Tiki Topple (summer, $20) is a reprint of a ten year old game. 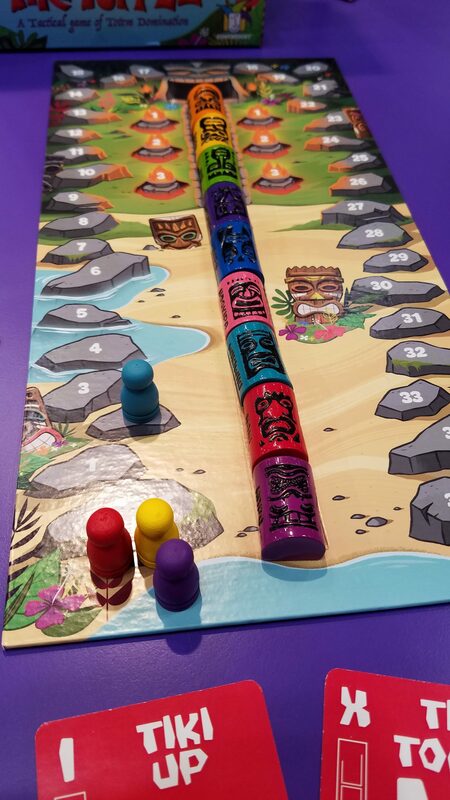 This new Mensa Select edition has players trying to assemble a totem pole with certain tiki heads nearest the top. 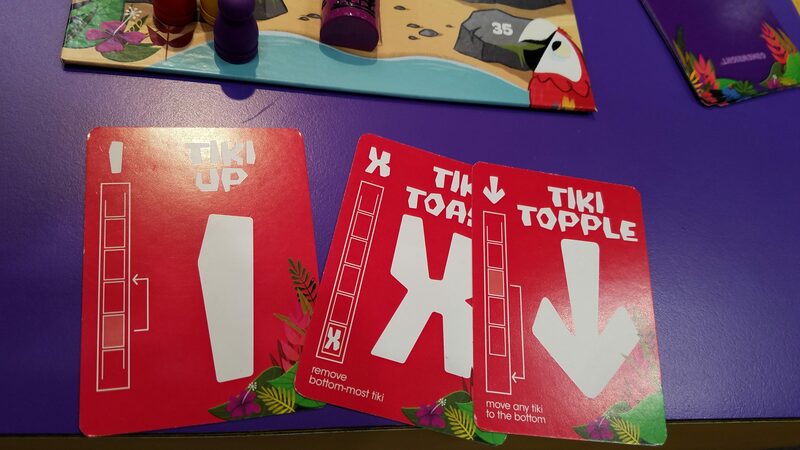 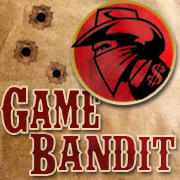 Cards that reorder and remove some sections of the pole are used to move your sections up and opponents’ down. 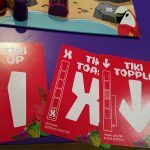 But can you tell which tiki heads your opponents are trying to get to the top? 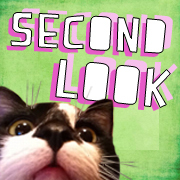 It’s a quick game that I really enjoyed playing a demo of — it reminded me a bit of Abandon Ship, but with simpler and shorter gameplay. 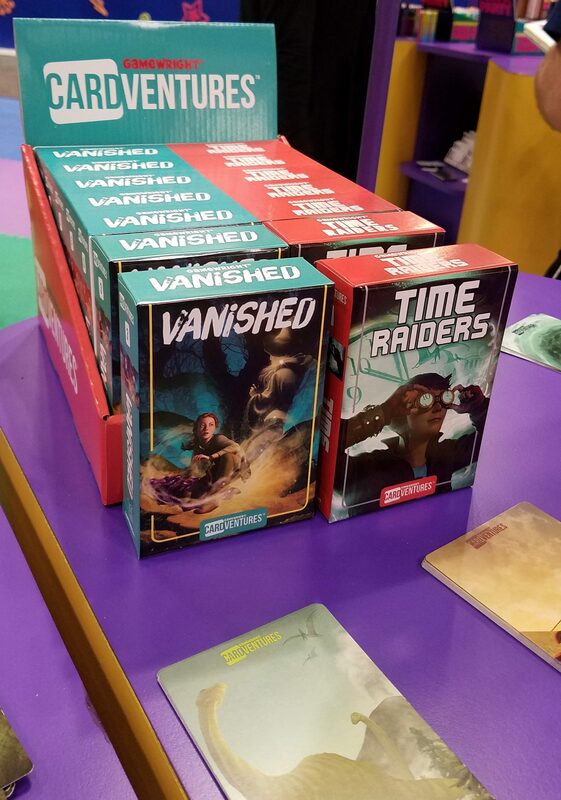 This summer, two new entries into the CardVentures line, Vanished and Time Raiders (each $10), will be released. 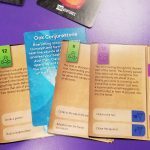 These choose-your-own-adventure-like games join last year’s Stowaway 52 and Jump Ship!. 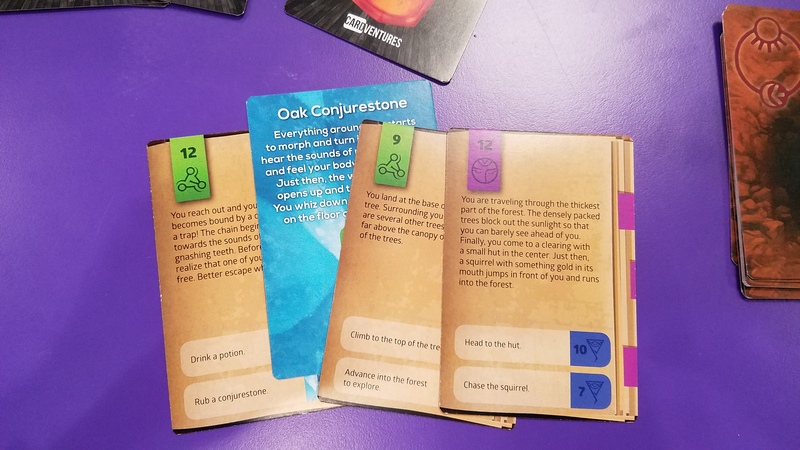 The single-player game is played with oversized cards with story elements, allowing you to jump to additional cards based on your choices to tell a story.